Prince William and Kate Middleton will marry on Friday 29 April at Westminster Abbey, Clarence House has announced. Prime Minister David Cameron said it would be "a happy and momentous occasion". It will be marked by a public holiday across the UK. The Royal Family and the Middletons will pay for the wedding itself, but the taxpayer will meet the cost of extra security and transport. The couple, both 28, got engaged while on holiday in Kenya in October. 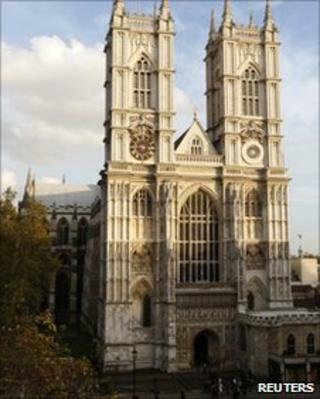 Westminster Abbey has hosted the weddings of the Queen and Queen Mother and was the venue for Princess Diana's funeral in 1997. The prince's private secretary, Jamie Lowther-Pinkerton, said the couple chose the Abbey for its "staggering beauty", 1,000-year royal history and its feeling of intimacy despite its size. He said William and Kate were "calling the shots" on the wedding plans, but had a "rather large supporting cast" to help them. "We know that the world will be watching on April 29, and the couple are very, very keen indeed that the spectacle should be a classic example of what Britain does best," Mr Lowther-Pinkerton said. "Prince William and Catherine have made it very clear that they wish everybody to be able to enjoy the day with them. "Consequently, the day will be a proper celebration for the nation and the realms. "Having said that, the couple are very mindful of the current situation, and for example, Prince William has already expressed a clear wish that any involvement by the armed forces should rely in great part on those servicemen and women already committed to public and ceremonial duties." The Dean of Westminster, the Very Reverend Dr John Hall, welcomed the couple's choice of venue. "We are very pleased they have chosen Westminster Abbey for their marriage and look forward to the detailed planning for what will be a great and happy occasion for the couple themselves, for their families and friends, for the country and Commonwealth and for well-wishers across the globe," he said. Media captionDean of Westminster: "Abbey is a very special place"
The BBC's Daniela Relph said William and Kate wanted to marry on a Friday in spring and 29 April was chosen because it fell after Easter and Lent and before a busy political programme in May and June. The extra holiday will fall in the same week as Easter Monday, giving millions of workers a three-day week. Mr Cameron said: "We want to mark the day as one of national celebration, a public holiday will ensure the most people possible will have a chance to celebrate on the day." The Scottish government followed suit in declaring a public holiday. The wedding date falls six days before the Holyrood elections on 5 May. As 28 working days are needed between dissolving parliament and polling day, parliament could be dissolved a day earlier than expected. Elections to the Welsh and Northern Ireland Assemblies, some English council polls and the UK-wide referendum on voting reform are due to take place the same day. But Mr Cameron dismissed concerns that the public holiday would come too close to polling day. "The timing of the wedding is entirely a matter for the Royal Family. People are perfectly capable of seeing the difference... a day of celebration and a referendum and local election campaign," he said. Earlier, there was prolonged applause at the Church of England's general synod when the Archbishop of Canterbury Dr Rowan Williams expressed "delight" at the forthcoming marriage on behalf of those present. Addressing the Queen, he said: "Prince William and Miss Middleton will be very much in our thoughts and prayers in the months to come and we know that you and the rest of the family will be supporting them with prayer and wisdom and love as we shall all be trying to do." Anti-monarchy group Republic said creating a bank holiday for something "most people are not interested in" was "absurd" and that an extra day off should only be for something everyone could relate to. Prince William proposed to Kate with his mother Diana's diamond and sapphire engagement ring. Asked why he had done so, he said: "It is very special to me and Kate is very special to me now as well. It is only right the two are put together." Mr Lowther-Pinkerton said the couple were "completely over the moon" about their engagement. "I've never seen two happier people," he added. The Press Association reported that a concert in Hyde Park had been proposed to coincide with William and Kate's wedding. It said a senior royal aide had refused to confirm the suggestion but had added: "Their view on it would be, 'Let's have a party.'" Meanwhile, the Bishop of Willesden, the Right Reverend Pete Broadbent, has been asked to withdraw from public ministry "until further notice" after he wrote on Facebook that the couple's marriage would only last for about seven years.